These were two cards I made last weekend when I was on a crafting weekend away with some friends. 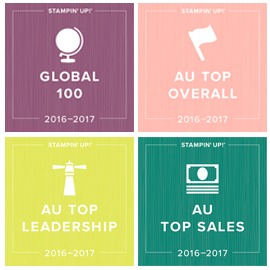 I wanted to try out the Stampin' Up! Irresistibly Floral DSP and new sponge brayers. The paper comes already clear embossed with a pattern (there are 12 sheets in 12x12" size, 2 sheets of 6 different patterns and only 3 are floral). I used one of the 3 non-floral patterns on this one. These 3 patterns would be perfect for masculine cards. 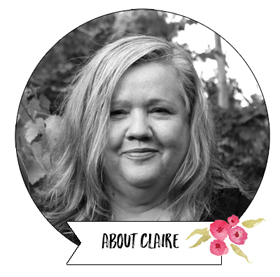 I used the sponge brayers to apply Dapper Denim ink, and then used copper embossing on the greeting. 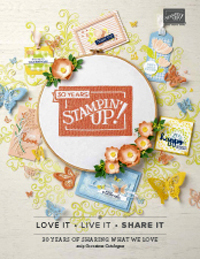 This greeting stamp is called Stylised Birthday and is a single stamp. I really like it! For this next card, I used two ink colours: Peekaboo Peach and Flirty Flamingo. The copper emboosing looks reat with these colours too. There are so many fabulous looks you can get with this paper. I would really recommend you having a play with it. With the sponge brayers, you get 4 sponges and 2 brayer handles in the box too. You can check out everything I've used on these cards using the links at the end of this post. I had a big box of 2016 Holiday Catalogues arrive on Friday and I'll be mailing them out towards the end of this week. If you don't have a demonstrator, or your demonstrator is no longer active, Register HERE and I will send you out a free copy! 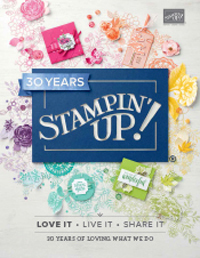 To stay up to date with all things Stampin' Up! and to be the first to hear about specials, offers and my retired product sales, sign up for my monthly blog subscriber email below (you can also subscribe to each blog post HERE). Thanks for stopping by today, hope to see you back again in a day or two. Get Holiday Catalogue goodies a month early. When you join in August (even just for yourself) you can get the new hoiday catty goodies as a preorder in your starter kit. You'll save 28% on them and then save an ongoing 20%. More details HERE.